Preheat the oven to 425°F. Spray a baking sheet with cooking spray. Season both sides of the fish with salt and 1/8 teaspoon pepper and set aside. Put almonds into a zip-lock baggie, seal, and crush with the back of a spoon (or simply use a food processor). Combine the almonds, bread crumbs, brown sugar, Old Bay Seasoning, cinnamon, and remaining pepper in a shallow bowl. Whisk together the egg and water in another bowl, and place the flour on a large plate. Coat both sides of the fish with flour and shake off the excess; dip in the egg and then coat evenly with the nut mixture. Place the fish on the baking sheet and bake 15 minutes or until golden brown on the bottom. Meanwhile, cook quinoa as directed on package and allow to cool. Dice bell pepper and oranges, and roughly chop spinach. Add all salad ingredients to a large bowl; toss to combine. 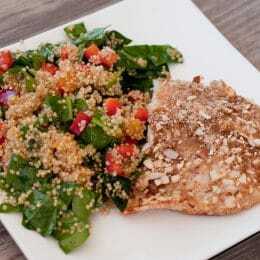 Serve tilapia with quinoa salad on the side.